Sight and hearing are the two main sensory modalities allowing us to interact with our environment. But what happens within the brain when it perceives a threatening signal, such as an aggressive voice? How does it distinguish a threatening voice from the surrounding noise? How does it process this information? To answer these questions, researchers from the University of Geneva (UNIGE), Switzerland, studied brain activity during the processing of various emotional voices. They discovered that we notice a voice much faster when it is considered threatening than when it is perceived as normal or happy. Our attention is more focused on threatening voices to enable us to clearly recognize the location of the potential threat. This study, published in the journal Social, Cognitive and Affective Neuroscience, demonstrates the resources leveraged by our brain when we sense danger to allow for adequate survival behavior. Sight and hearing are the two senses that allow human beings to detect threatening situations. Although sight is critical, it does not allow for a 360-degree coverage of the surrounding space—unlike hearing. 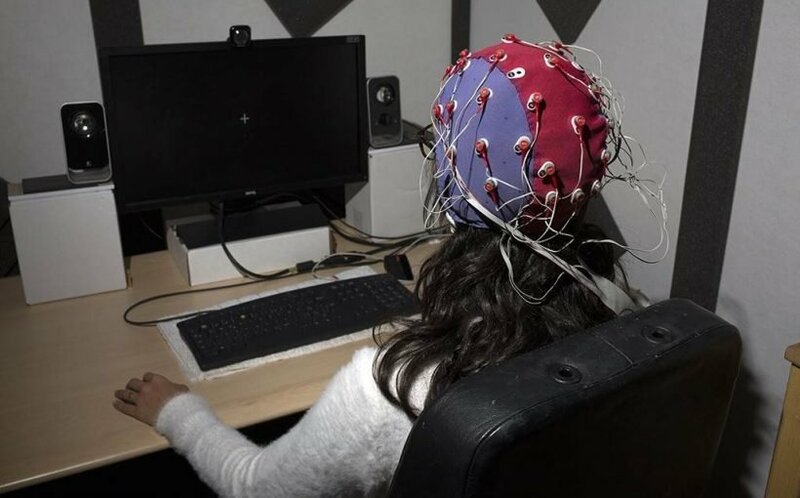 “That’s why we are interested in how fast our attention responds to the different intonations of the voices around us and how our brain deals with potentially threatening situations,” explains Nicolas Burra, a researcher in the psychology section of the Faculty of Psychology and Education Sciences (FPSE) at UNIGE. To examine the brain’s response to threats in the auditory environment, the researchers presented 22 short human voice sounds (600 milliseconds) that were neutral utterances or expressed either anger or joy. Using two loudspeakers, these sounds were presented to 35 participants while an electroencephalogram (EEG) measured electrical activity in the brain down to the millisecond. More specifically, the researchers focused on the electrophysiological components related to auditory attentional processing. “Each participant heard two sounds simultaneously: two neutral voices, one neutral and one angry voice, or one neutral and one happy voice. When they perceived anger or joy, they had to respond by pressing a key on a keyboard as accurately and quickly as possible,” explains Leonardo Ceravolo, researcher at UNIGE’s Swiss Centre for Affective Sciences. “We then measured the intensity of brain activity when attention is focused on the different sounds, as well as the duration of this focus before a return to the basic state,” he adds. Subsequently, after 400 milliseconds, our attention must disengage from the emotional vocal stimulus. At this moment, a cerebral marker of auditory attention, called LPCpc, intervenes. Interestingly enough, LPCpc activity is also stronger for angry than for happy voices. Why? “Anger can signal a potential threat, which is why the brain analyzes these kinds of stimuli for a longer time. In an auditory environment, this mechanism allows us to not become alarmed at the slightest potentially threatening noise or, conversely, to adopt the most appropriate behavior in case of danger. These extra milliseconds of attention are, therefore, crucial to the accurate interpretation of a threat in a complex auditory environment,” says Ceravolo. This additional temporal cost was also evident in the participants’ response times. When they had to indicate that they perceived anger, it took them longer than when they did so for joy. In contrast, brain activity was enhanced in the case of angry stimuli. Does it sound conflicting? “No. The explanation is logical. As attention in the brain remains focused on the threatening sound, the motor response via the keyboard is delayed,” says Nicolas Burra. Computer games and hyperactivity disorder attention deficit (ADHD): is there a connection?